Tortured by a violent past, El Salvador has been on the reparatory path since a long and arduous civil war was resolved in 1992. And despite the additional hardship of a disastrous earthquake in 2001, El Salvadorians maintain a warmth and hospitality that is refreshing. With 300 kilometres of coastline in its domain, El Salvador has recently become recognized as something of a hot-spot for surfers. But El Salvador's real attractions lie beyond its beaches. Inland, monumental volcanic peaks dot the landscape; the mystifying Montecristo cloud forest captivates visitors; and the ancient Mayan ritual sacrifice site of Tazumal bears testimony to the central significance of El Salvador in a past era. Before the Spanish conquest, the area that now is El Salvador was composed of three great indigenous states and several principalities. The indigenous inhabitants were the Pipils, a tribe of the nomadic people of Nahua settled down for a long time in central Mexico. The region of the east was populated and governed by the Lencas. The North zone of the Lempa Hi River was populated and governed by the Chortis, a Mayan people. The first Spanish attempt to subjugate this area failed in 1524, when Pedro de Alvarado was forced to retreat by Pipil warriors. In 1528 he sent a second expedition, which succeeded, and the Spanish founded their first capital city in El Salvador at a place known today as Ciudad Vieja, the first site of the Villa de San Salvador, 10 kilometres south of Suchitoto. This capital was occupied from 1528 until 1545 when it was abandoned, and the capital city moved to where modern San Salvador is today. The first "shout of independence" in El Salvador came in 1811, at the hands of criollo elite. Many intellectuals and merchants had grown tired of the overpowering control that Spain still had in the American colonies, and were interested in expanding their export markets to Britain and the United States. In 1821, El Salvador and the other Central American provinces declared their independence from Spain. In 1823, the United Provinces of Central America was formed by the five Central American states under General Manuel José Arce. When this federation was dissolved in 1839, El Salvador became an independent republic. El Salvador's early history as an independent state was marked by frequent revolutions. During the 19th century, the coffee industry grew inexorably in El Salvador and provided the bulk of the government's financial support through import duties on goods imported with the foreign currencies that coffee sales earned. Between 1931, the year of Gen. Maximiliano Hernández Martínez's coup, and 1944, when he was deposed, there was brutal suppression of rural resistance.From the 1930s to the 1970s, authoritarian governments employed political repression and limited reform to maintain power, despite the trappings of democracy. During the 1970s, there was great political instability. In 1979 the reformist Revolutionary Government Junta took power. Both the extreme right and the extreme left now disagreed with the government and increased political violence quickly turned into a civil war. The Chapultepec Peace Accords marked the end of the war in 1992 and FMLN (Farabundo Martí National Liberation Front) became one of the major political parties.Economic reforms since the early 1990s have brought major benefits in terms of improved social conditions, diversification of its export sector, and access to international financial markets at investment grade level, while crime remains a major problem for the investment climate. El Salvador border Guatemala to the west and Honduras to the north and east. It is the only Central American country that does not have a Caribbean coastline. It covers around 21,040 km2 and, together with Belize is one of the smaller countries in the western hemisphere. The highest point in the country is Cerro El Pital at 2,730 metres above sea level and which is located on the border with Honduras. There are several rivers flowing through El Salvador into the Pacific, such as the Goascorán, Jiboa, Torola, Paz and the Río Grande de San Miguel. The Lempa River is the only navigatable river in the country and flows from Guatemala and Honduras across El Salvador to the ocean. Volcanic craters enclose lakes, like Lake Ilopango and Lake Coatepeque. Lake Güija is El Salvador's largest natural lake but there are larger artificial lakes created by the damming of the Lempa, of which Embalse Cerrón Grande at 135 km² is the largest one. El Salvador is organised into 14 departments: Ahuachapán, Cabañas, Chalatenango, Cuscatlán, La Libertad, La Paz, La Union, Morazán, San Miguel, San Salvador, San Vicente, Santa Ana, Sonsonate and Usulután. San Salvador - capital and largest city of the country. San Miguel - most important city in the central east of the country. Santa Ana - gateway to the beautiful west of the country. El Salvador, together with Belize, is some of the smallest country in Central America, but still has a lot to offer on culture, nature and beaches. The countryside of El Salvador is breathtaking, with volcanoes and mountains offering "green" adventurers exactly what they are looking for. Many of environmentally-oriented community-based organizations promote eco-tourism, and there are a number of beautiful and secluded beaches and forests scattered throughout the country. One should also visit the colonial towns of Apaneca, Juayua, Panchimalco, and Suchitoto as well as the Mayan sites of San Andrés, Joya de Cerén (the Pompeii of Central America and an UNESCO World Heritage Site), and Tazumal, whose main pyramid rises some 33 metres into the air. The on-site museum showcases artifacts from the Pipil culture (the builders of Tazumal), and paintings that illustrate life in pre-Hispanic El Salvador. Souvenir hunters will find some of the best artisans in San Juan el Espino and in La Palma (the artisan capital of El Salvador). San Miguel in the east offers tourists a more authentic way to see El Salvador by getting off the beaten track to see its countryside, coastline and lakes. The beaches in El Salvador are a great spot to relax, enjoy the local atmosphere but above all the coastline of El Salvador is gaining a reputation of having some of the best surfing in the world. The best spots include La Libertad (near San Salvador), El Sunzal, Playa Las Flores, El Zonte and the wild El Este, which make El Salvador the fastest growing surf tourism hot-spot in Central America. Suchitoto is located in the Cuscatlán department and is known throughout El Salvador for its cobblestoned streets and its famous historic Church. In fact, Suchitoto is one of the few places left in the country were one can still find cobblestoned streets. On top of that, it also is surrounded by some great landscapes and has an excellent view of the Suchitlán lake. Both among foreigners and Salvadoreans it is a very popular destination for Salvadoreans and besides its picture perfect looks it has some wide activities and sights including art galleries, handicrafts markets and cultural centers. Joya de Ceren Archaeological Site is one of the highlights of the country and is placed on the Unesco World Heritage List. It is known as a former pre-Hispanic farming community that was buried as a result of an eruption of the Laguna Caldera around 600 AD. One can call it the Pompeii of El Salvador. Because of the exceptional condition of the remains, they provide an insight into the daily lives of the Central American populations who worked the land at that time. Ruta Las Flores - or "The Flower Trail"
This important El Salvador Tradition is a religious festival known as Semana Santa in the Spanish-speaking world and features a carnival-like atmosphere across Latin America. Best experienced in San Salvador with street parades and performance art, the week-long event is usually held in late March through Easter Sunday. The Panchimalco Flower and Palm Festival in May is a good time to take in local culture. Admire beautiful floral arrangements and garlands displayed throughout the towns, villages and beach resorts nationwide. Accompanying the event is music and traditional dress. The best time to be in Santa Ana - though perhaps not if you want peace and quiet - is Fiesta Julias which runs through the month of July. There are street parades, masses and cultural events galore in this most colonial of Salvadoran cities. There are also fairground rides and clowns for the kids. Of all El Salvador Holidays, Fiestas Agostinas, in early August is one of the most popular ones. Held in the capital of San Salvador, a marching band wakes the city up at 4:00am, after which parades, sports, food, and art exhibitions take place. This fun, fiery event in late August is held in Nejapa - just north of San Salvador - and sees fire-throwers with elaborately painted faces on the streets and a general appearance of anarchy. September 15 marks El Salvador's independence from Spain in 1821 with flag-waving, parades and fireworks on the beaches, in the cities and mountain towns. The biggest national day celebrations take place in San Salvador. November in San Miguel is party time, with beautiful dancing girls and parades to honor the San Miguel patron saint. Bands from the region play reggae, samba and funky, local merengue on the streets. El Salvador's climate is like most of the other countries in Central America. Tropical conditions with high temperatures and humidity are the norm. Temperatures are generally around 30 °C during the day, while nights are around 20 °C , a bit higher along the coastline, a bit colder more inland. At higher altitudes temperatures can drop significantly, especially at night. The wet season lasts from May to November, thus making December to April a better time for a visit. This is also the time that hurricanes sometimes strike the country, leaving with it torrential rains, powerful winds and mud slides. Cuscatlán International Airport (SAL) near San Salvador receives a number of international flights, for example with the national airline TACA, which is actually comprised of 5 different Central American airlines. It mainly flies to cities in the United States, Canada and countries in Central America, but also has flights to Bogota in Colombia, Lima in Peru and to Madrid in Spain. For the time being, there are no rail links to neighbouring Guatemala. El Salvador has four border crossings with Guatemala and three with Honduras, where you can enter by car. You must have proof that you own the car of have your rental documents ready. An international driving permit is sufficient to enter the country and you have to leave the country within 30 days. Trans Mermex offers services between El Salvador and Guatemala, while Pullmantur has buses to Guatemala and Tegucigalpa in Honduras. Transnica has buses between El Salvador and Managua in Nicaragua. Ticabus has a wide range of services, from Tapachula in Mexico through Guatemala and on to San Salvador and buses from San Pedro Sula and Tegucigalpa in Honduras to San Salvador. There are even buses from as far as Panama, through Costa Rica and Nicaragua to El Salvador. Another big operator is King Quality, which travels on the San José de Costa Rica - Tapachula (Mexico) route, with buses between the capitals of Costa Rica, Nicaragua, Honduras, El Salvador and Guatemala. You might be able to catch a boat to neighbouring countries like Guatemala, Honduras and even Nicaragua, but these do not include scheduled passenger services, rather irregular boats now and then. La Libertad and La Union are your best bet to shop around. Although you can theoretically cross the Golfo de Fonseca to Nicaragua, this is not a regular crossing (you'll need to hire a private boat) and you should talk to immigration in Managua or San Salvador before attempting it. The price is US$ 65 for the 2-hour trip. There are no domestic flights, as distances are small. For the time being, there are no regular passenger services by rail in the country. Getting around by El Salvador by rental car is a good option and roads are generally in a relatively good shape. You can rent cars from both international and local agencies at the international airport or downtown in San Salvador. Driving is on the rights side of the road and try to avoid driving when it's dark, as car jackings are quit common. A national or international driving permit is required when renting or driving your own car for less than a month. Otherwise, you need to buy a El Salvadorian permit, or just cross borders and come back again. There are regular bus connections all day long between all major cities and towns. Services are cheap and reliable in general, but when the weather is bad, delays can be the case. Buses are old American school buses and bus stations are not a fancy place, to say the least. Many buses originate and terminate in San Salvador and services start early in the morning but become much less frequent after 6:00 or 7:00pm. For an overview of schedules and connections, also international ones, see thebussschedule.com. There are regular passengers boats around the Bahía de Jiquilisco and a passenger and car ferry across Lago Suchitlán. Citizens of the USA, Canada, Australia, New Zealand, South Africa, Switzerland, Norway, Japan, Taiwan, Brazil, Argentina, Mexico, other Central American countries, Israel, UK and other EU member countries do not need an advance visa, but must purchase a single-entry tourist card for US$10 when entering the country. It is typically good for 30 days, but you can request up to 90 days but be sure to ask when you step up to the immigration counter. All other nationalities need a visa which costs $30. Note that since 2006 a 90-day stay actually means a stay within the Centro America 4 (CA4) region, including Honduras, Guatemala and Nicaragua. You can extend the stay with another 90 days, after which you have to leave the region, for example to Belize, Mexico or Costa Rica. The US Dollar, or "greenback", is the national currency of El Salvador. One dollar consists of 100 cents. Frequently used coins are the penny (1¢), nickel (5¢), dime (10¢) and quarter (25¢). 50¢ and $1 coins also exist, but are rarely used. Frequently used banknotes are the $1, $5, $10 and $20 notes. $2, $50 and $100 notes can also be found, but are rarely used. Spanish is the official language of El Salvador. However, a large part of the population does speak English. Around 1% of people speak Izalco or Nahuat, the Pipil language. El Salvador has an excellent range of small hotels and backpacker hostels, particularly in San Salvador and western El Salvador. Camping and eco-albergues (ecohostels; basic shared cabins, some with modest kitchen facilities) are found around popular outdoor destinations. Bring your own camping equipment. Prices go up during the first week of August (summer holidays) and Semana Santa (Easter week), when it's also best to book ahead. There are no vaccinations legally required to travel to El Salvador. There is one exception though. You need a yellow fever vaccination if you have travelled to a country (7 days or less before entering El Salvador) where that disease is widely prevalent. It's a good thing to get your vaccinations in order before travelling to El Salvador. The general vaccination against Diphtheria, Tetanus and Polio (DTP) is recommended. Also a hepatitis A vaccination is recommended and vaccination against hepatitis B, rabies and typhoid are also sometimes recommended for stays longer than 3 months. Malaria is prevalent in the country and it is recommended to take malaria pills and take other normal anti-mosquito precautions as well. Dengue sometimes occurs as well. There is no vaccination, so buy mosquito repellent (preferably with 50% DEET), and sleep under a net. Also wear long sleeves if possible. Internet cafes are available in pretty much every town and charge around US$1-2 per hour. There is almost always wifi (usually free of charge) in hostels, mostly in midrange and luxury hotels (but less so in budget hotels and guesthouses), but connection speeds and reliability varies dramatically. Be aware that many high-end hotels charge between $3 and $10 per day for internet use although some will let you log on and print an airline boarding pass free of charge. The international country code for El Salvador is 503. The general emergency number is 911. To place a call within El Salvador, simply dial the eight-digit number beginning with 2 for landlines and 7 for cellphones. The main companies are Movistar, Tigo, Digicel, and Claro, with Tigo reputedly giving the best overall reception. When using your own cell phone, the roaming can cost anywhere between $1 and $4 a minute and internet charges are extremely high as well. It's better to buy a local SIM card, which can be bought for about US$25-30 and have much lower rates. Especially when you are in the country for a longer time and wish to use internet and make a call regularly, this might be a better option. Pay-as-you-go phones can be purchased in the airport, the cheapest of which cost $60. Make sure to ask if the phone can take international calls and how much this costs, as packages vary and can be restrictively expensive. Look out for promotions such as free incoming calls and cheap international calls for US$0.10 a minute with certain networks. Correos de El Salvador is the country's postal service. Most towns in El Salvador have post offices marked by a blue sign reading correos. Post offices are open Monday through Friday from 8:00am to 5:00pm in larger cities, and 7:00am to noon and 2:00 to 5:00pm in small towns. To mail a standard letter or a postcard from El Salvador to the United States costs around US$0.70 and US$1 to Europe and Australia. It might take anywhere from a week to the USA to a few weeks further afield. If you'd like to send a package, it might be better to use an international company like TNT, DHL, UPS or FedEx, as they are fast, reliable and not overly expensive. just ask any thing about you want in el salvador and i´ll answer you. General travel information, help with contacts, local tours or just meeting travelers. Also work with local NGOs and volunteering. 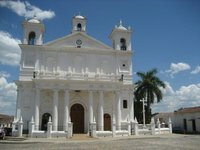 I lived and studied in San Salvador for a month, and can help out with general tourism and expat info for El Salvador. Use our map of places to stay in El Salvador to explore your accommodation options and to compare prices across the country at a glance. To narrow the results down by budget category, use the links below. This is version 55. Last edited at 14:16 on Oct 29, 18 by Utrecht. 27 articles link to this page.